German Talmudist; born probably at Bonn 1160-65; died about 1235. He belonged to a German family of scholars; his father, Joel ben Isaac ha-Levi, was a prominent teacher of the Talmud, and his maternal grandfather was Eliezer b. Nathan, perhaps the greatest Talmudist of Germany in the early part of the twelfth century. Eliezer's first teacher was his father; he then attended the yeshibot of Metz, Mayence, and Speyer. His teachers in Mayence and Speyer were Eliezer b. Samuel and Moses b. Solomon ha-Kohen, two pupils of Jacob Tam. Isaac b. Asher II. of the yeshibah at Speyer is often designated by him as his teacher. Eliezer settled first at Bonn, whence he went to Bingen, where he and his family barely escaped a massacre at New-Year. On this occasion he lost all his property, including his books and manuscripts. In 1200 he succeeded his father as chief rabbi of Cologne, his assistants being Menahem b. David and Shealtiel b. Menahem; he conducted at the same time a large yeshibah. He took part in the Synod of Mayence (1220 or 1223), which had for its object the amelioration of the moral, religious, and social condition of the communities. 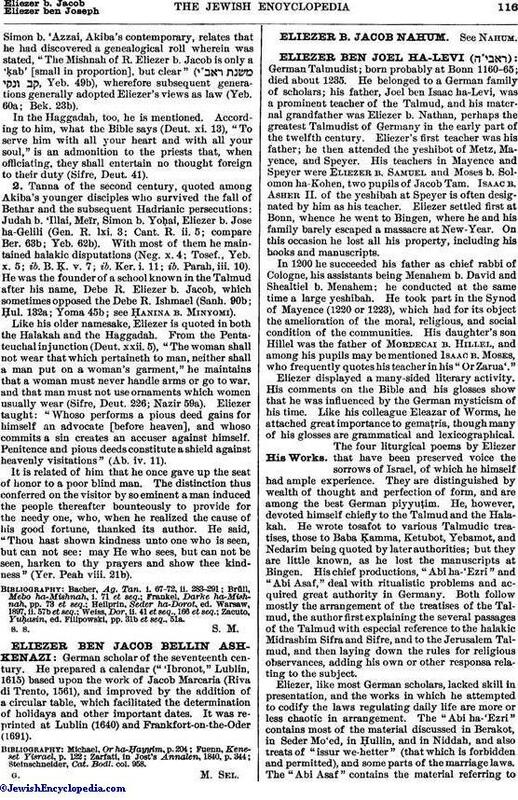 His daughter's son Hillel was the father of Mordecai b. Hillel, and among his pupils may be mentioned Isaac b. Moses, who frequently quotes his teacher in his "Or Zarua'." Eliezer displayed a many-sided literary activity. His comments on the Bible and his glosses show that he was influenced by the German mysticism of his time. Like his colleague Eleazar of Worms, he attached great importance to gemaṭria, though many of his glosses are grammatical and lexicographical. The four liturgical poems by Eliezer that have been preserved voice the sorrows of Israel, of which he himself had ample experience. They are distinguished by wealth of thought and perfection of form, and are among the best German piyyuṭim. He, however, devoted himself chiefly to the Talmud and the Halakah. He wrote tosafot to various Talmudic treatises, those to Baba Ḳamma, Ketubot, Yebamot, and Nedarim being quoted by later authorities; but they are little known, as he lost the manuscripts at Bingen. His chief productions, "Abi ha-'Ezri" and "Abi Asaf," deal with ritualistic problems and acquired great authority in Germany. 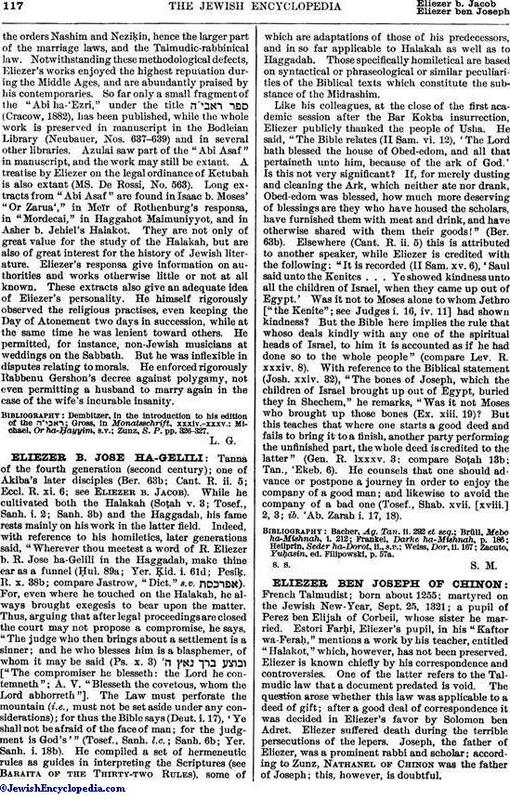 Both follow mostly the arrangement of the treatises of the Talmud, the author first explaining the several passages of the Talmud with especial reference to the halakic Midrashim Sifra and Sifre, and to the Jerusalem Talmud, and then laying down the rules for religious observances, adding his own or other responsa relating to the subject. Eliezer, like most German scholars, lacked skill in presentation, and the works in which he attempted to codify the laws regulating daily life are more or less chaotic in arrangement. The "Abi ha-'Ezri" contains most of the material discussed in Berakot, in Seder Mo'ed, in Ḥullin, and in Niddah, and also treats of "issur we-hetter" (that which is forbidden and permitted), and some parts of the marriage laws. The "Abi Asaf" contains the material referring tothe orders Nashim and Neziḳin, hence the larger part of the marriage laws, and the Talmudic-rabbinical law. Notwithstanding these methodological defects, Eliezer's works enjoyed the highest reputation during the Middle Ages, and are abundantly praised by his contemporaries. So far only a small fragment of the "Abi ha-'Ezri," under the title (Cracow, 1882), has been published, while the whole work is preserved in manuscript in the Bodleian Library (Neubauer, Nos. 637-639) and in several other libraries. Azulai saw part of the "Abi Asaf" in manuscript, and the work may still be extant. A treatise by Eliezer on the legal ordinance of Ketubah is also extant (MS. De Rossi, No. 563). Long extracts from "Abi Asaf" are found in Isaac b. Moses' "Or Zarua'," in Meïr of Rothenburg's responsa, in "Mordecai," in Haggahot Maimuniyyot, and in Asher b. Jehiel's Halakot. They are not only of great value for the study of the Halakah, but are also of great interest for the history of Jewish literature. Eliezer's responsa give information on authorities and works otherwise little or not at all known. These extracts also give an adequate idea of Eliezer's personality. He himself rigorously observed the religious practises, even keeping the Day of Atonement two days in succession, while at the same time he was lenient toward others. He permitted, for instance, non-Jewish musicians at weddings on the Sabbath. But he was inflexible in disputes relating to morals. He enforced rigorously Rabbenu Gershon's decree against polygamy, not even permitting a husband to marry again in the case of the wife's incurable insanity. Zunz, S. P. pp. 326-327.